As a NYC wedding photographer I am often asked to travel 20 minutes north of The Big Apple to create wonderful wedding photos at Untermyer Park and Gardens located in Yonkers, New York. As you peruse this web site you will see quite a few images captured here from The Walled Garden with it’s reflecting pools, bridges and classic architectural elements; to the rock garden located outside The Walled Garden...a great spot to create dramatic landscape shots. This picture was taken on a day when Mother Nature was threatening the bride and groom with bad weather. The overcast skies and the storm clouds made for some great pictures. Alas the rains never came and we spent an hour exploring every corner of these magnificent gardens and taking awesome wedding pictures. 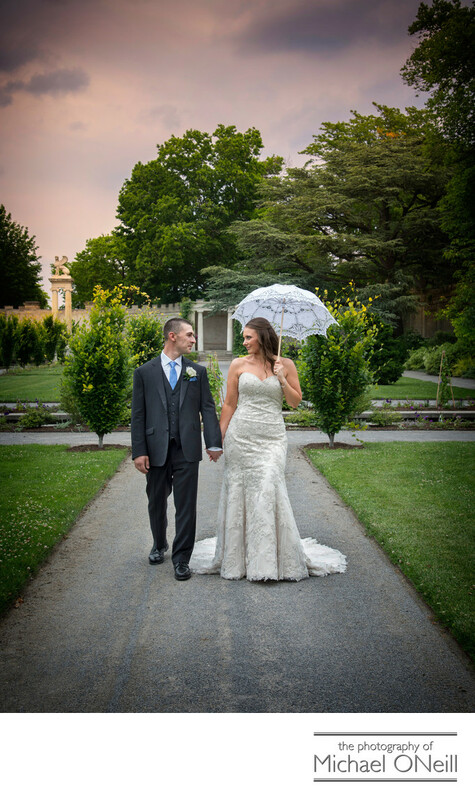 If you are planning a wedding and thinking of incorporating Untermyer Gardens into your wedding plans be sure to choose a photographer who has experience taking pictures here. An experienced wedding photographer working with a skilled photographic assistant will know how to make the most of your portrait session at this amazing place.